We bought two cords of wood last fall. One, stacked in the garage, hasn’t been touched. Here’s what’s left of the cord we worked from over the winter: I measured the pile; it’s about 28 cu. 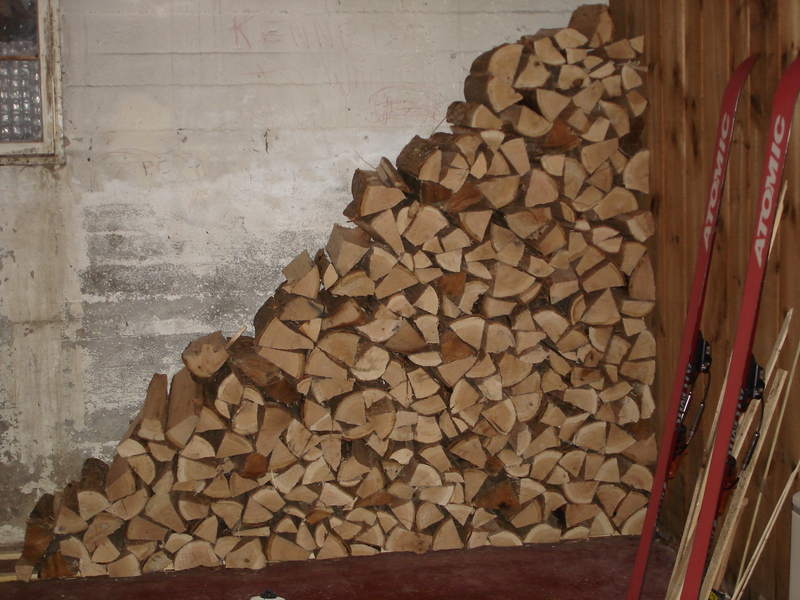 ft. A cord of wood (stacked) is 128 cu. ft. So, we have roughly 22% of a cord of a cord remaining, and burned about 78% of one cord over the winter. So that makes me feel good. Not warm, per se, but good. This entry was posted on March 11, 2010 at 7:14 am and is filed under Uncategorized. You can follow any responses to this entry through the RSS 2.0 feed. You can leave a response, or trackback from your own site. .72 cords is really nothing. I usually burn a little under 2 cords a season 24/7 for my heating needs provided the wood is properly seasoned and mainly comprised of higher btu species. The Nebraska datalink is the most comprehensive wood burning guide however I think their usage estimates is based upon old technology stoves. The big question remains: Will you continue this experiment into the next heating season or are you going to spend more time/exercise scrounging for free firewood?